The valleys seemed pretty low when the USC lost by 34 points at UCLA and then struggled again against Arizona State Thursday. The peaks seemed pretty high when the Trojans held the lead late in the first half against the No. 1 team in the country, Arizona, reminiscent of last season’s upset. 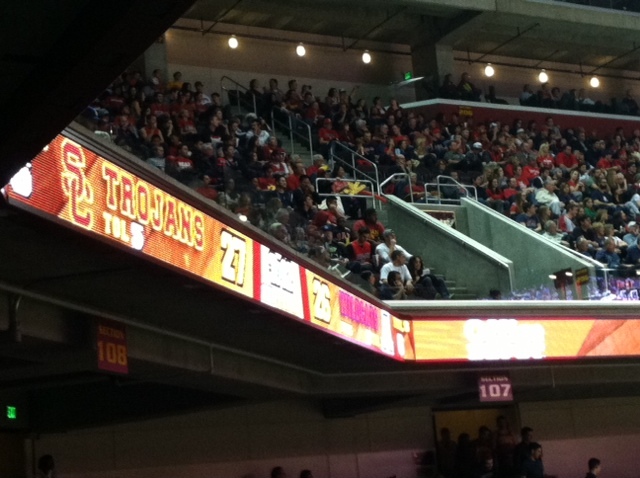 Photo evidence that USC held the lead against the No. 1 team in the nation, Arizona, late in the first half. Ultimately the Trojans finished just below sea level, falling to Arizona, 73-53, Sunday night in front of an energetic crowd at the Galen Center. Kevin O’Neill famously nicknamed Strahinja Gavrilovic “Luis” because Strahinja was too difficult to pronounce. Whatever you call him, Gavrilovic made a name for himself Sunday, scoring more points (10) than he scored all season entering the night (6 total points). Gavrilovic also grabbed four rebounds in 19 minutes. With Gavrilovic playing so well off the bench, D.J. Haley only recorded two minutes, all in the first half. Center Omar Oraby struggled once again offensively with 7-footer Kaleb Tarczewski guarding him. He finished with two points, and only has 13 total points in the first three Pac-12 games. “You either play man or zone,” he said. “We played a little bit of both tonight, and I thought our zone was very effective. Three guards–Julian Jacobs (34 minutes), Pe’Shon Howard (33 minutes) and Byron Wesley (37 minutes)–played the majority of the game. J.T. Terrell (13 minutes) and Kahlil Dukes (2 minutes) made appearances, while Chass Bryan and Roschon Prince were both DNP-CDs. Enfield singled out Jacobs for his play against Arizona. The freshman had nine points to go along with four assists, four steals and two turnovers. 8,347 fans packed into the Galen Center, easily the largest crowd of the season. Many of the fans supported the Wildcats, but the USC student section also showed up in force on the last day of winter break. The Trojans seemed to feed off the crowd’s energy, especially in the first half. Two Los Angeles Lakers showed up to support their teams. Nick Young (USC) and Jordan Hill (Arizona) sat next to each other under the basket by the USC student section. 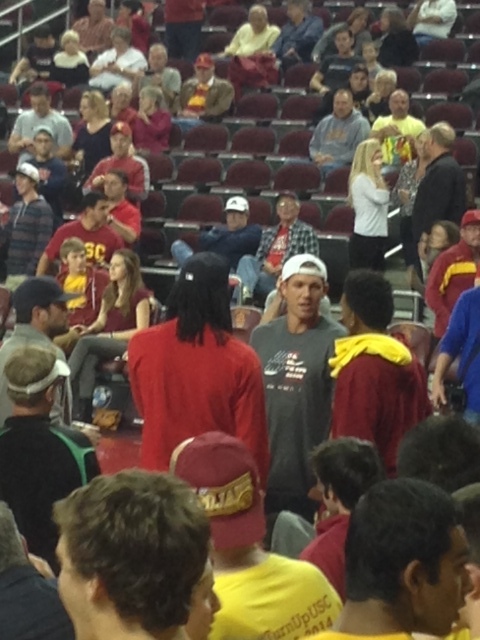 On the other side, Luke Walton (Arizona) and Matt Leinart (USC) took in the action. In addition, Lakers general manager Mitch Kupchak was in attendance scouting the game. USC travels to play at Utah Thursday at 7 PM, and then at Colorado Saturday morning at 11 AM.